EverQuest II is the next generation of massively multiplayer gaming, a huge online world where friends have come together for adventure and community. Featuring breathtaking graphics and vast, beautiful and dangerous game world to explore, EverQuest II sets the standard for graphical realism as players are immersed in the game's exciting locales and mysterious lands. Millions have played the EverQuest franchise, one of the most immersive online game worlds ever. EverQuest II is the next generation of massively multiplayer gaming, a huge online world where players come together for adventure and community. Players enter this world by creating their own unique character from 19 races and 24 classes, using a powerful customization system for unprecedented player individuality. Players will encounter thousands of creatures as they travel across a majestic landscape of enchanted forests, deadly volcanic plains, rolling hills, and bustling cities. EverQuest®II Sentinel's Fate™ and EverQuest®II Sentinel's Fate™ Collectors Edition, the sixth expansion for the popular online game EverQuest®II, is now available for pre-order at www.everquest2.com. 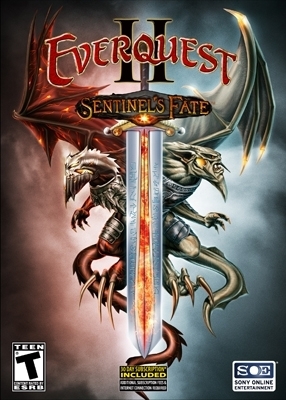 ABOUT EVERQUEST II SENTINEL'S FATE: EverQuest II Sentinel's Fate takes players into the fabled lands of Odus, filled with epic quests, magnificent dungeons and limitless content providing the ultimate MMO experience for all players. Sentinel's Fate presents the next chapter of the EverQuest II legacy which will be written by the passion of players and fueled by the hunger for adventure. This page last modified 2010-02-10 11:48:31.